G Suite doesn’t offer any native backup other than limited time recycle bin and version history. This presents potential security risks. Ransomware can also encrypt all your files on cloud. File sync programs make this scenario even more worse. When G Suite experiences technical problems, you can log into to Nexetic portal and access the information. Almost 60% of data loss on cloud is due to end user errors. Accidental file deletions and unwanted changes to shared files can cause excessive damage. Information is backed up and stored in EU. You are able to restore data fast and reliably. Malicious data deletion is a common problem. Also you never know when you need to retrieve an old email for legal cases. When production data moves to cloud, many organisations don't realize that they are still responsible for their data no matter where data it's located. You can get your cloud protected sooner than you think. You don’t need to install any software. With one click of a button you can turn on backup for all users and all your data on G Suite. Backup is continuous so all your data is protected always and everywhere. Automatic backup twice a day. Restore to your computer. Restore to cloud. You can restore data to your local computer or back to G Suite environment. You can also access and restore previous versions. Also deleted emails and files. Our data centers are located in Europe. All data is encrypted before it is transferred from G Suite to Nexetic. Data remains encrypted during transmission and in our data centers. Information is encrypted automatically by customer-specific encryption key. Only you can access and restore your information. You can see all your company’s computers from the Shield Backup portal. 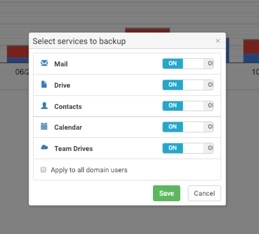 You can for example monitor backup and add new users. You can login with G Suite credentials. Also permissions are herited from G Suite. Are you Manage Service Provider and want to offer G Suite backup to your customers? No problems, we support multi-tenant environment. Extra disk space is only needed if capacity provided by licenses is not enough. Usually customers don’t need extra disk space. The data centers are certified by TÜV as TSA (Technical Supervisory Association) . Highly available TIER III facilities.